Medical Laboratory Science, Usmanu Danfodiyo University, Sokoto, Nigeria. Received: July 30th, 2010; revised August 6th, 2010; accepted September 14th, 2010.
ruled out particularly in extremely scanty specimens with a clinica l suspicion of malignancy. 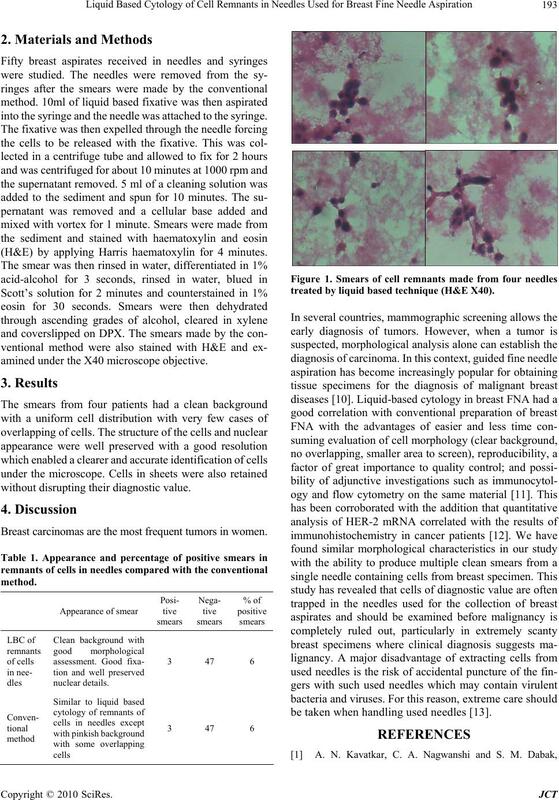 conventional cytological technique for breast specime ns. into the syringe and the needle was attached to the syringe. (H&E) by applying Harris haematoxylin for 4 minutes. amined under the X40 microscope objective. without disrupting their diag n ost i c val ue. Breast carcinomas are the most frequent tumors in women. treated by liquid based technique (H&E X40). be taken when handling used needles . Vol.51, No. 2, 2008, pp. 190-4. Cytopathology. Vol.17, No. 2, 2006, pp. 82-85. B. Weynand, M. Berlière, E. Haumont, F. Massart, A.
Vol. 47, No. 2, 2003, pp. 149-153. 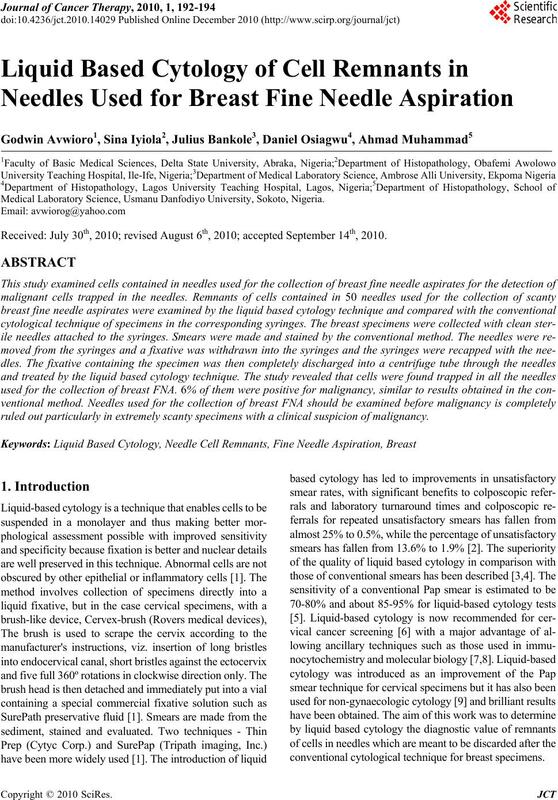 Setting of a Large F rench labora tory,” Acta Cytologica Vol. 47, No. 5, 2003, pp. 753-761. Laboratory Medicine, Vol. 12No. 5, 2003, pp. 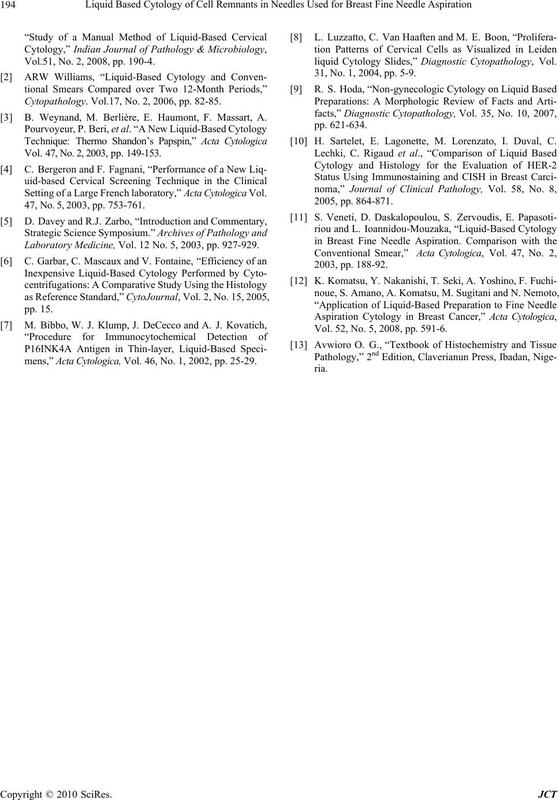 927-929.
mens,” Acta Cytologica , Vol. 46, No. 1, 2002, pp. 25-29.
liquid Cytology Slides,” Diagnostic Cytopathology, Vol. 31, No. 1, 2004, pp. 5-9. H. Sartelet, E. Lagonette, M. Lorenzato, I. Duval, C.
Vol. 52, No. 5, 2008, pp. 591-6.